Essentially a process operating by living organisms, the biogas industry is a natural target for synthetic biology. Synthetic biology combines biology and engineering to design and construct biological devices. Contrary to traditional genetic engineering that only alters an already existing DNA sequence, synthetic biology allows us to build entirely new sequences of DNA and put them to work in cells. This allows us to build novel biological devices that would never exist in nature. Constructions and operations of devices that do not exist in nature, such as tools, vehicles, computers and the internet, have crafted modern civilization. Now, it is synthetic biology that is challenging nature’s limitations and advancing civilization to a higher level. Generating biogas via anaerobic digestion of biomass and organic waste is one of the few proven, cost-effective, scalable biomass energy strategies. Biogas consists of mainly methane and carbon dioxide, and combustion of methane with air generates energy which can be used for many purposes such as cooking, heating, producing electricity and vehicle fuel. As a result, countless biogas plants are operating around the globe helping to clean up waste and generate energy. With more plants being built, they come in all sizes ranging from household to factory scales. Anaerobic digestion is a process where extremely complex microbial communities degrade organic matter, such as sugars, fats and proteins, resulting in biogas as the primary end-product. Such inherent complexity makes this process very difficult to optimize. Mechanical engineers have made tremendous progress to optimize this process, but in many places it still requires government subsidies to be profitable. In an anaerobic digester, many different types of Bacteria convert the complex organic matter in waste or biomass to hydrogen gas, carbon dioxide, formate and acetate. 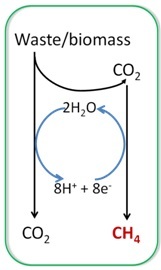 A unique group of methanogenic Archaea then produces the invaluable part of biogas, methane, by eating hydrogen and carbon dioxide, formate or acetate. Among numerous microbes in anaerobic digester, methanogenic Archaea are one of a few microbial groups that have been extensively studied, and a number of genetic tools are available for engineering via synthetic biology. Therefore, scientists have begun to reprogram methanogenic archaea, allowing them to eat organic matter such as sugars and directly produce methane. If they succeed, they may engineer a super microbe that never existed in nature and revolutionize the biogas industry by making anaerobic digestion much simpler and more efficient. There is also the possibility of more applications downstream. For instance, upgrading biogas by removal of carbon dioxide improves its combustibility. A super microbe could be made to upgrade biogas using hydrogen gas or even electricity to form more methane from carbon dioxide. Conceptualized super cell that converts idealized organic matter (2CH2O) directly into biogas. However promising, grand challenges remain when it comes to applying synthetic biology to the biogas industry. About 10,000 moving parts are needed to make an automobile, millions of parts for an airplane, and all the parts are standardized. Similar to those engineering sectors, synthetic biology also needs many standardized genetic parts and modules to be able to create biological devices that can really revolutionize an industry. 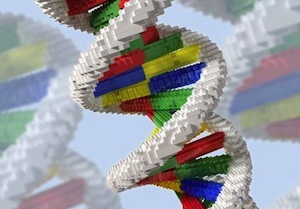 Sophisticated genetic tools are needed as well to assemble these parts and put them to work. However, few such parts, modules and tools are at disposal for engineering microbes in an anaerobic digester. Take methanogenic Archaea for example, only three parts are available in the iGEM registry, the world largest collection of biological parts for synthetic biology. Another challenge is an apparent neglect of synthetic biology by the biogas industry. Symposiums bringing professionals from biogas industry and synthetic biology together for discussions are rare, as are major investments for promoting synthetic biology. As a result, few research groups are developing synthetic tools and parts for the biogas industry. For example, the aforementioned three iGEM parts were all contributed by only one group, the UGA-iGEM team at the University of Georgia. Synthetic biology is developing faster than ever, and its cost continues to fall. Thanks to prompt actions of many industrial pioneers in embracing and supporting synthetic biology, it is already starting to revolutionize a few fields. Synthetic biology also holds great potentials to revolutionize the biogas industry. To achieve this goal, joint efforts between the biogas industry and academia must be made. The former side needs to understand what synthetic biology can achieve, while the latter side should identify which parts of the process in the biogas industry can be re-designed and optimized by synthetic biology. Once the two sides start to work together, novel synthetic parts and tools are bound to be invented, and they will make anaerobic digestion a better process for the biogas industry. Tagged Acetate, Anaerobic Digester, Anaerobic digestion, Archaea, Biogas, Biogas Industry, Biomass, Carbon dioxide, Eukarya, Formate, Genetic Engineering, Methane, Methanogenic, Microorganisms, organic wastes, Super microbe, Synthetic Biology, Uses of Synthetic Biology. Bookmark the permalink. A good article. Have you looked at a better mechanism to extract the lignin from the ligno-cellulose? In all of the plants we have viewed the issues have resolved around this missing preparatory detail. A friend’s group is looking to remove the lignin through the use of super-heated water by dissolving the lignin within 30 minutes under low pressure conditions and has thus extracted hydrogen from the lignin which remains in solution as it passes to the anaerobic digestion system. They then use digesters at 15 metres depth with parallel tubes of around 260 mm diameter inside the digester as the controlling mechanism which then results in being able to extract the optimum methane content from the reformed cellulose and hemicellulose materials fairly easily. Thanks for raising a good point, Paul. We haven’t looked at the lignin in terms of anaerobic digestion, but one could imagine synthetic biology should be able to at least optimize the natural system of lignin degradation. However, people have been exploring other and probably more profitable use of lignin instead of converting it into biogas, since lignin is a very large natural source of aromatic compounds. For instance, you may make bioplastics by adding aromatic compounds derived from lignin. Thanks for your interest in biogas, Nasser. Silica gel has been used as an absorber to remove remove contaminants from biogas. Some studies have also shown that addition of silica gel in an bioreactor could also improve total production of biogas. However, it remains elusive whether the improvement is due to catalytic effect of the silica gel or simply just a byproduct of the absorbance effect, to my knowledge. Can you please explain how to create anaerobic environment inside the digester? Whether some bacteria ought to be used or employ some other technique? Anaerobic environment in the digester is created by the naturally-occurring anaerobic microorganisms. Usually biogas plants are seeded with animal manure or sewage sludge at the startup to increase the concentration of anaerobes in the digester. Thanks for the informative article. Can you further elaborate on the efficacy of this kind of super microbe in breaking down both solid & liquid wastes in sub zero temperatures?